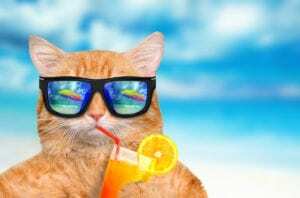 Keeping cats cool seems like a silly thing to do as most cat owners know how much cats love to laze in the sun. But the reality is that when temperatures soar, cats are at risk of heatstroke and should be protected where possible. Here are some steps you can take to keep your cats cool and comfortable in the heat. Make sure your cat has plenty of fresh water, always. Replacing the water a few times a day can encourage your cat to drink, and placing multiple bowls around the house and garden will ensure that water is within easy reach. 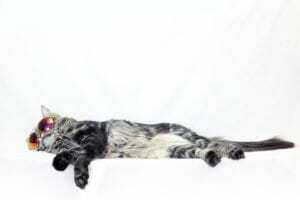 Most cats will enjoy a snooze in the sunshine and then retire to a shady spot when they get too hot. Ensure your cat has a few cool and shady spots to retreat to around the house and garden. Also don’t be surprised if you find your cat lying on the tiles on the kitchen floor or the bathroom. Tiles and materials such as porcelain keep cool and so cats will gravitate towards them when they are a little too hot. Elevate your cat’s bed. Cloth-covered plastic frames with short legs will allow your cat to sleep in comfort during hot weather. The air passing under the bed helps keep cats cool. Brush your cat often. A well-groomed, tangle-free coat will help to keep your cat cool. If your cat has long fur, consider professional clipping to help ease their suffering during summer. Country Animal Clinic in Somerset West has a Pet Spa on the premises that takes great care of cat hair. White and light-coloured cats also have very pale skin and can be subject to sunburn. Talk to your veterinarian about whether giving your cat a clip could help to keep them cool in the hot weather. Another option is to have only the tummy clipped, which offers sun protection as well as cooling. The same goes for checking cars. If you leave your windows open to let the car cool down, always check that a cat hasn’t snuck inside before you drive away. Ensure that your cat is microchipped so that if it ends up locked in someone else’s shed or wanders off, you can both be reunited as quickly as possible. Symptoms of heatstroke include: excessive panting; lethargy; drooling; fever; vomiting; collapse or unconsciousness. If you are worried about your cat or suspect they are suffering from heatstroke, please get your cat to the vet immediately. Heatstroke can be fatal unless treated quickly.